Now that I’ve think about it, I seldom blog about DIY projects although I’ve done quite a lot in the past—from skincare to household. Recently, I did another one with Stud Lace No-Tie, No-Bow Shoelaces I got from Charis. It’s a very easy DIY project, that I guarantee, and we’ll never know how much convenience it will give us until we’re done. Shall we start then? Stud Lace No-Tie, No-Bow Shoelaces set. It includes two garterized laces that is good for a pair of shoes. There are six pieces each of studs and stud bases and you’ll have to use four pairs right away. Two pairs are considered backups and you will be needing that in case the studs broke. Having backups are always a good idea, don’t you think? Manual is included too and they are all neatly placed in a transparent PVC pouch. I had to make my own virtual manual on how I make things so easy. It barely took me ten minutes to complete everything. So first, you must have a clean, lace-free sneakers. I am using my printed Keds sneakers that I got on sale. Insert the laces just like how you would ribbon your shoes. Don’t make it too tight. 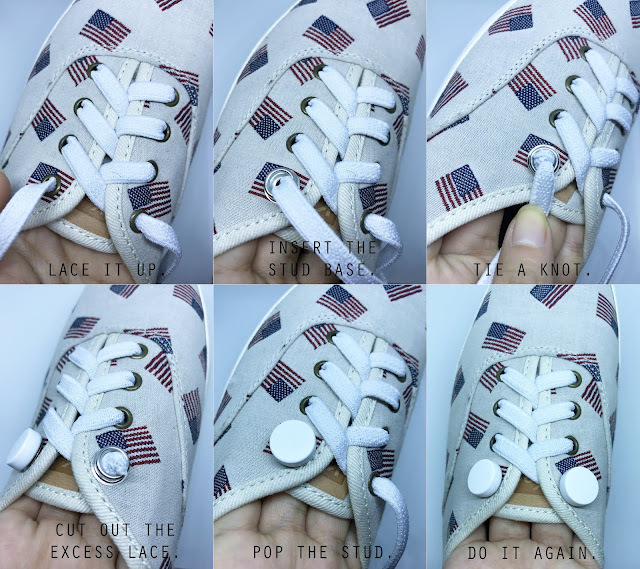 Then, insert the stud base as close as possible to the shoe eyelets and then tie a tight knot before you cut the extra laces. Pop the studs and then repeat the process on the other side. Easy peasy, right? If you are someone who always hurry and wanted to save extra time in lacing ribbons, this is the best bet for you. It’s very simple and comfortable. The laces are made with high grade latex for maximum comfort with zero sagging and will provide a very convenient slip-on experience. Both the laces and studs come in different colors that you can choose from whatever your shoes' colorway is. You can also mix and match the laces based on your preference. You can snag these for only $7.99 when you visit my CHARIS SHOP!